When Norwegian songsmith (and 1/2 of Kings of Convenience) Erlend Oye formed THE WHITEST BOY ALIVE (in Germany, no less), he intended the band to rely on electronics, but then reality got in the way and the quartet evolved into a groove-oriented band with quirky yet instantly likeable (if not loveable) tunes. While guitar, keyboards and Erlend's vocals are front and center, the band's rhythm section really makes THE WHITEST BOY ALIVE special.. While not exactly Funk, the band relies on funky rhythms much in the same way that early Talking Heads and Postcard Records-era Scottish bands used to. Throw in some Jazz flourishes on keyboards and you've got yourself an audio treat! On Rules(Asound/Bubbles), the band's 2009 release, THE WHITEST BOY ALIVE are still as ernest as ever, creating spacious little gems that demand attention before sinking under your skin and then spending weeks occupying those little spaces in your brain you didn't realize were there! Sometimes, it's what they don't play that makes the songs work so much better. There's not much overdubbing (if any at all) and every guitar and keyboard lick are there to accent the constant flow of the rhythm section. There's plenty of space in these songs, which allow them to breathe while gently beating the listener over the head with one infectious track after another. 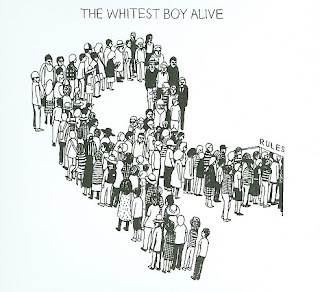 On first listen, it may seem smooth and delicious, but once you really dig in, The Whitest Boy Alive's Rules is as big and beefy as they come.